Is it relevant and important? How and why? How can the level and quality of judicial capabilities affect that confidence? Short presentations and plenary discussion, with commentary of panel chair. What judicial capabilities are relevant and important? What can be done to improve those capabilities? Impact on public and international confidence. Implications for developing judicial capabilities. Impacts on public and international confidence. Judicial capabilities needed to deal with it. How to go about identifying needs. The Supreme People's Court of the People's Republic of China hosted the 4th APJRF Meeting in Beijing between 25 and 28 October 2010. The theme of the Meeting was "Using Technology to Improve Court Performance" and its focus was on using technology to improve access to justice, reduce case backlogs, improve judicial decision making and manage courts. 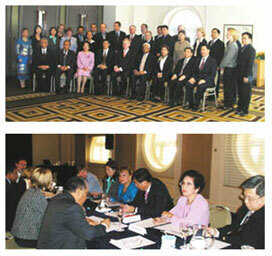 The previous round table meeting of the Asia-Pacific Judicial Reform Forum (APJRF) was held in Singapore from 19 to 21 January 2009. The objective of the round table meeting was to review and discuss the chapters of a judicial reform publication written by Forum member countries along with judicial reform programmes which have been implemented in several member countries. Photos and papers are available on this website. The design of the Judicial Reform Handbook project was based upon the precept that Asia Pacific Judicial Reform Forum (APJRF) member countries will be closely involved in all stages of the project. • wider discussions and also feedback on the draft content from the broader APJRF membership via email and the APJRF on-line discussion forum. 2. Direct Engagement - at the Peer Review/Validation Workshop. The aim of the Peer Review/Validation Workshop was to: maximise the quality and relevance of the proposed publication’s content; promote ownership of this project initiative within the APJRF’s membership; and further develop the APJRF’s reform network. The workshop provided a forum for chapter authors, peer and other reviewers, and the APJRF membership’s representatives, the Project Board to interact. The feedback developed on draft contributions was actively discussed and incorporated in to the proposed text. This significantly strengthening the content and analysis within the publication, and allowed the content to be finalised. Aim of the Chapter Authors’ Inception Workshop: The aim of the Workshop was to contribute to the successful drafting of the Judicial Reform Handbook, developing a set of practical tools and resources to assist APJRF member countries to implement judicial reform programs more effectively. provide an opportunity for the team to interact, exchange ideas, and develop a collegial and supportive peer group. The second APJRF Round Table Meeting was held between 27-29 May in Putrajaya, Malaysia. The Meeting was hosted by the Chief Justice of Malaysia and was attended by delegates from many APJRF member countries. - Court and Tribunal Administrative Reform. - Caseload Audit and Backlog Reduction. - Access to Justice Initiatives. Contributing to the development of the Judicial Reform Handbook project through the sharing of national reform efforts. to examine judicial reform experiences that have potential for replication or adaptation by the APJR member countries.